The North American monsoon, variously known as the Southwest monsoon, the Mexican monsoon, the New Mexican monsoon, or the Arizona monsoon, is a pattern of pronounced increase in thunderstorms and rainfall over large areas of the southwestern United States and northwestern Mexico, typically occurring between July and mid September. During the monsoon, thunderstorms are fueled by daytime heating and build up during the late afternoon-early evening. Typically, these storms dissipate by late night, and the next day starts out fair, with the cycle repeating daily. The monsoon typically loses its energy by mid-September when drier and cooler conditions are reestablished over the region. Geographically, the North American monsoon precipitation region is centered over the Sierra Madre Occidental in the Mexican states of Sinaloa, Durango, Sonora and Chihuahua. The North American Monsoon is not as strong or persistent as its Indian counterpart, mainly because the Mexican Plateau is not as high or as large as the Tibetan Plateau in Asia. However, the North American Monsoon shares most of the basic characteristics of its Indian counterpart. There is a shift in wind patterns in summer which occurs as Mexico and the southwest U.S. warm under intense solar heating. As this happens, the flow reverses. The prevailing winds start to flow from moist ocean areas into dry land areas. The North American monsoon is associated with an area of high pressure called the subtropical ridge that moves northward during the summer months and a thermal low (a trough of low pressure which develops from intense surface heating) over the Mexican Plateau and the Desert Southwest of the United States. The monsoon begins in late May to early June in southern Mexico and quickly spreads along the western slopes of the Sierra Madre Occidental, reaching Arizona and New Mexico in early July. The monsoon extends into the southwest United States as it matures in mid-July, when an area of high pressure, called the monsoon or subtropical ridge, develops in the upper atmosphere over the Four Corners region, creating wind flow aloft from the east or southeast. Pulses of low level moisture are transported primarily from the Gulf of California and eastern Pacific. The Gulf of California, a narrow body of water surrounded by mountains, is particularly important for low-level moisture transport into Arizona and Sonora. Upper level moisture is also transported into the region, mainly from the Gulf of Mexico by easterly winds aloft. Once the forests of the Sierra Madre Occidental green up from the initial monsoon rains, evaporation and plant transpiration can add additional moisture to the atmosphere which will then flow into Arizona. Finally, if the southern Plains of the U.S. are unusually wet and green during the early summer months, that area can also serve as a moisture source. As precipitable water values rise in early summer, brief but often torrential thunderstorms can occur, especially over mountainous terrain. This activity is occasionally enhanced by the passage of tropical waves and the entrainment of the remnants of tropical cyclones. Flash flooding is a serious danger during the monsoon. Dry washes can become raging rivers in an instant, even when no storms are visible as a storm can cause a flash flood tens of miles away; it is therefore wise to avoid camping in a dry wash during the monsoon. Lightning strikes are also a significant danger. Because it is dangerous to be caught in the open when these storms suddenly appear, many golf courses in Arizona have thunderstorm warning systems. 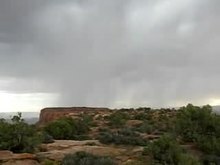 An isolated thunderstorm rolls through Wah Wah Valley, Utah. This type of monsoonal pattern is very common in the late summer of the southwest US. The North American Monsoon circulation pattern typically develops in late May or early June over southwest Mexico. By mid to late summer, thunderstorms increase over the "core" region of the southwest U.S. and northwest Mexico, including the U.S. and Mexican states of Arizona, New Mexico, Sonora, Chihuahua, Sinaloa and Durango. The monsoon typically arrives in mid to late June over northwest Mexico, and early July over the southwest U.S. Once the monsoon is underway, mountain ranges, including the Sierra Madre Occidental and the Mogollon Rim provide a focusing mechanism for the daily development of thunderstorms. Thus much of the monsoon rainfall occurs in mountainous terrain. For example, monsoon rainfall in the Sierra Madre Occidental typically ranges from 10 to 15 inches. Since the southwest U.S. is at the northern fringe of the monsoon, precipitation is less and tends to be more variable. Areas farther west of the core monsoon region, namely California and Baja California, typically receive only spotty monsoon-related rainfall. In those areas, the intense solar heating is not strong enough to overcome a continual supply of cold water from the North Pacific Ocean moving down the west coast of North America. Winds do turn toward the land in these areas, but the cool moist air actually stabilizes the atmosphere. The monsoon pushes as far west as the Peninsular Ranges and Transverse Ranges of southern California, but rarely reaches the coastal strip. As shown in the panorama below, a wall of thunderstorms, only a half-hour's drive away, is a common sight from the sunny skies along the coast during the monsoon. Unlike the Pacific region of the United States and the west coast of Baja California, precipitation in the North American monsoon is not associated with large-scale mid-latitude cyclones, but with thunderstorms which have very different spatial/temporal distribution characteristics. The difficulty in understanding the variability of summertime convective activity in the southwestern U.S. and northwestern Mexico results from the complex interactions between atmospheric circulation features at both the synoptic (100 to 1000 km spatially, 1 day to 1 week, temporally) and mesoscale (several km to 100 km, hours to one day temporally) and the extremely varied topography. The larger-scale atmospheric motions may control the distribution of water vapor and the general stability or instability (that is, the tendency to form storms) in the atmosphere; nevertheless, local topographic effects are critical to the geographic and even temporal distribution of convective activity. ^ a b This article incorporates public domain material from the United States Geological Survey document: Adams, David K. (1997). "Review of Variability in the North American Monsoon". Impact of Climate Change and Land Use in the Southwestern United States. ^ "The Monsoon". National Weather Service Forecast Office Flagstaff, Arizona. Retrieved 2008-02-28. ^ a b c d e This article incorporates public domain material from the National Weather Service document "North American Monsoon". ^ Junker, Norman W. "Maddox Type IV Event". Retrieved 2008-02-29. ^ "Reports to the Nation: The North American Monsoon" (PDF). Climate Prediction Center. Retrieved 2008-02-29. ^ Roth, David M. "Tropical Cyclone Rainfall for the West". Retrieved 2008-02-29.